Polish Pottery Dinner Plates are made of high quality stoneware. Each stoneware plate is hand crafted at KM factory in Boleslawiec, Poland where artisans meticulously decorate it by hand. 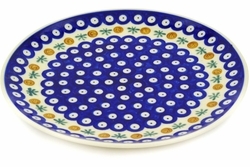 This versatile and cheerful Polish Pottery plate is ideal for serving a variety of dishes. This dinner plate is one of our favorites and will give you plenty of room to serve your favorite food. The hand-painted surface is scratch resistant, durable, hygienic and easy-to-clean.